Family and friends of Forrest King are raising money to pay for uninsured medical expenses associated with Catastrophic Injury. Early Tuesday morning on September 20th 2016, Forrest King was leaving for work when two men attacked him in an attempted carjacking. While Forrest was being assaulted at gun point his 8 year old son, Ronin, came out to say goodbye interrupting the robbery. The robbers then pointed their gun at his young child. As Ronin ran to get help Forrest was able to free himself, but as he turned to run away he was shot in the back. Forrest called 911 before passing out from blood loss. The bullet entered his back shattering his T5 & T6 vertebrae, severing his spinal cord, puncturing his lung, breaking a rib and exiting through his chest. His impact with the ground resulted in a dislocated & fractured elbow. Because of his injuries, doctors had to perform immediate surgery to fuse his T3 through T8 vertebrae. With the complete injury to his spinal cord Forrest is not expected to walk again. Forrest has remained optimistic and a model patient even through respiratory and digestive system complications and multiple operations. Through these difficult days and concerns for the well-being of himself and his family, Forrest is the first to put those around him at ease with a smile and a warm hello. 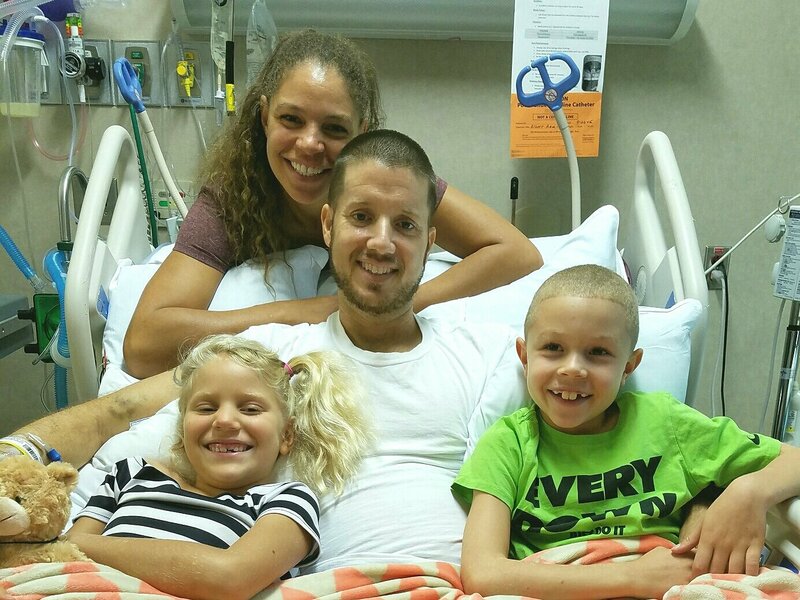 Forrest and his family are focused on his recovery. They must re-design the world he existed in as independently mobile into one that will support his needs. These changes will be expensive but are vital to his recovery and ability to care for his family. The next phase of care for Forrest will be rehabilitation. Doctors are confident that he will be ready very soon and this next phase of care will require financial assistance. The flight alone to transport Forrest will cost his family $25,000. His family will be relocating in order to be with him. Unfortunately, insurance will not completely cover the expenses for his care and needs. The high cost of Forrest’s ongoing health and personal care will be well beyond the ordinary. This is why he has chosen to fund raise through Help Hope Live. Help Hope Live provides both tax-deductibility to the full extent allowed by law and fiscal accountability to all contributors. You can be sure your donation will be used to help with uninsured medically-related expenses. With your help Forrest, Alissa, Ronin and Irie can concentrate on healing their family. Forrest is continuing to maintain a positive outlook: not focusing on what he has lost but continuing to focus on what he still has. To make a donation to this fundraising campaign, click on the Donate Now button. For more information, please contact Help Hope Live at 800.642.8399. We have a like new power wheelchair and wondering if it would be helpful to Mr. King. Please let me know. Richard Bilger cares for my cats and shared your story with me. I am so sorry this has happened to you and your family...sending good thoughts to you all as your recovery continues. We are sending continued healing thoughts and love. We miss you guys. Happy Holidays! Hope you guys had a wonderful Christmas I think about y'all everyday!! As always if you need anything please let me know!!! Thinking of you and sending you healing thoughts and best wishes during this Christmas season of miracles , hope and love. Merry Christmas, Forrest! Please send updates. I'd love to hear your thoughts. Hug Alissa for me, & hug the little men too! To Forrest and family. So sorry to hear what happened and are sending our thoughts to you from Maine. We're friends with Marguerite, Richard and Betsy. Sending you love and positive thoughts! Prayers from our family to yours. Forrest, We're keeping you and the fam in our thoughts and prayers! Sending much love to you, Alissa, Ronin and Irie. We love you guys and are always here for you. The A's love you and hope to see you guys soon. Thanks for being such great friends through the years and for being the kind of parents that set a great example for the rest of us. As your neighbor down the road, I want to help you know you are loved and you are not alone. I pray for you often, thinking of the times I have seen your family out walking or throwing the football. Thank you for always being quick to smile. Your family is beautiful and special, and there are good days to come. Feel blessed this day and may God continue to strengthen and bind you. You and your family are in our thoughts! You demonstrated such bravery and love, and circumstances that certainly deserve the community to come together as one to help support your treatment! just donated anonymously..but i am friends with betsy bilger and have been thinking of your family since the day it happened.I just had surgery and can't do much for another month...but after that i would like to offer help in any way with kids, errands,etc.much love sent your way. Please let me know how I can help. What a nightmare. Your bravery and courage are stunning. Can I help on legal stuff or maybe come visit? As a wheelchair buddy? You all are in my thoughts and prayers. Know that many people are behind you and cheering you toward recovery! Great spirit, your wife is great as well. I will keep you and your family in my prayers. Hey Forrest...I love you! Your positive attitude through all of this is amazing, and inspiring. You are a great brother! The best! See you very soon! Sending big love and hugs from a former Anami family. Thinking of you all! Continue to keep the positive faith and strength. As my family and I continue to pray for speedy recovery. Hello, we've never met, but someone I know says you've been important in her life, so I hope the little I can do can help. Good luck, and keep strong. Forrest I have not seen you in years! I was so sad to hear this tragic news. Please know I am praying for you and your family. Sending a ton of love and positive energy to everyone. Miss you, bud. I'm going to come visit when I can. You're in my thoughts. Forrest! You're in my thoughts. Jake and I will be back out to see you soon. Sending you lots of love. Sending love & strength your way, Forrest! Sending SO MUCH love and support and healing... that's no joke and I'm so sorry for this infuriating event in your lives. :( I'm here to help - just let me know what I can do. Hugs all around!!! Forrest, I am so sorry to hear what happened. Your smile is so nice to see and your family is beautiful. Stay strong and positive and you will get through it! Forrest & Family, we are devastated and heartbroken for you and your entire family. Hope you continue to be encouraged by all the love and support surrounding you. Your positivity is inspiring. We last saw you a few years ago at Neil's house and we didn't recognize you at first. You were so kind and funny and it was great to catch up with you (it had been many years). Dear Forrest, Sending thoughts and prayers for a complete and swift recovery. Sending Love and Light to you and your family. Looking forward to seeing you before you leave for rehabilitation. So many people are praying for you--including my students. Remember: Pray Forrest Strong! It is so good to see you getting stronger, and pulling through all of this. I am thankful everyday that I have such a great brother, and that we have such a supportive, amazing family. I am always here if you need anything! Much Love to you! You have all been so strong through this life changing event. I have prayed for you every day and know that you will come out stronger on the other end of this ordeal. Love to each of you. You are all in our thoughts and prayers! Please let us know how we can help moving forward. Thinking of you all each day. Stay strong. Lover you. I am thinking of you all daily. Sending you love and light. Love, Love, Love to Forrest and his family. I am praying for a full recovery and ease until that occurs. Hundreds of my friends will also be praying. Oh my goodness, reading this all for the first time! I couldn't open your texts. You are all in our thoughts and prayers!! God has a plan for Forrest!! May he continue to be brave, strong and in a "I can beat this" attitude!! Love to you all!! Ben Grobe is my brother in law. We are praying for you! Sending many prayers to you all...we are here if you need us! You are always in our prayers. Keep strong - you can do this!! Love to you all! Thoughts and well wishes go out to you and your whole family. Never give up! You have a lot of people pulling for you! God bless you at this time. Keep Him in your heart and He will be beside you through your healing process. We got word of your injuries today and we are praying for you all tonight at our church in Trujillo, Peru. May God give you peace and strength as you begin the recovery process. We are thinking of you guys every day and are here for ANYTHING you need. Please don't hesitate to call upon us for anything at all no matter how big or small it may seem. Sending huge hugs and love from The Merl Family! Forrest, I'm searching for the right thing to say hearing this news. I have fond memories of my sweet and funny childhood friend and it's so great to see your lovely family here. It sounds like everyone is taking care of you including yourself. Your positive perspective is going to get you through. I'll be keeping you and your family in my heart as you heal. Hi Forrest, I haven't seen you in 20 years. You have a beautiful family! Our prayers are with you and your family. Hang in there. Forrest my friend... I'm praying for you. I haven't seen or heard from you in years but I've always wondered how you were. Sad to hear the news of what you are going through right now. Chin up!!! We love you all so much and are here for you whenever you need anything. We will be thinking of you everyday and sending you good thoughts. Forrest, I'm saddened to hear this news. You have a lovely family and while your journey will be difficult, the photo shows how positive the entire group seems to be, and that means everything. Hang in there, old friend. We love you, Forrest. We are honoured to help in this way and in any way that we can. God bless you, darlin .